Wow, after American Pickers I really did not have very much hope for this show. I have very little knowledge of this series going into it, but I had no idea how enjoyable watching people drive (not sarcastic) could be. It actually made me want to watch the Deadliest Catch because I enjoyed this show so much. First of all, being a New Englander I love me some white stuff. The first snow of the year is one of my favorite days of the winter season, and this show brought be right back to delivering pizzas in the middle of a blizzard. This may be a new fad for me, as I recently fell in love with car shows. Although I have no interest in trucks or ever driving nor do I want any knowledge of driving them, this show was still engaging. The act of breaking going down a steep hill with another big rig right in front of them gives you that “edge of your seat” feeling. For everyone that has never watched, Ice Road Truckers is about these crazy tuckers who drive from Fairbanks to Prudhoe Bay, Alaska unloading oil equipment. I know that sounds kind of tame, but it is anything but. There are frequent malfunctions, crashes, medical problems and trucks carrying explosives. While the cinematography is not nearly as excellent as its predecessor Deadliest Catch (by the way that show looks better and better every season,) the cinematography had definitely improved since the last season (I caught some on re-run). There are some great under ice shots as the trucks drive over frozen ocean expanses. Also, the characters are really engaging and have fantastic arcs. I really loved Lisa’s need to prove herself, it made for a nice character evolution. But the most engaging character is Alex. His past health troubles mixed with his new found safety OCD really make for a great moment in TV. I would highly recommend this show to anyone who enjoys quality reality TV without the exploitation. While I do think that some of the show can be a bit boring, the exciting sections more than make up for it. 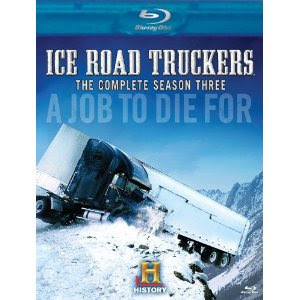 Ice Road Truckers Season 3 is available on Blu-Ray and DVD from Amazon.com and other DVD retailers. Thank you to The History Channel for providing a copy for our Blu-Ray review. We were in no way compensated and all opinions are strictly our own.